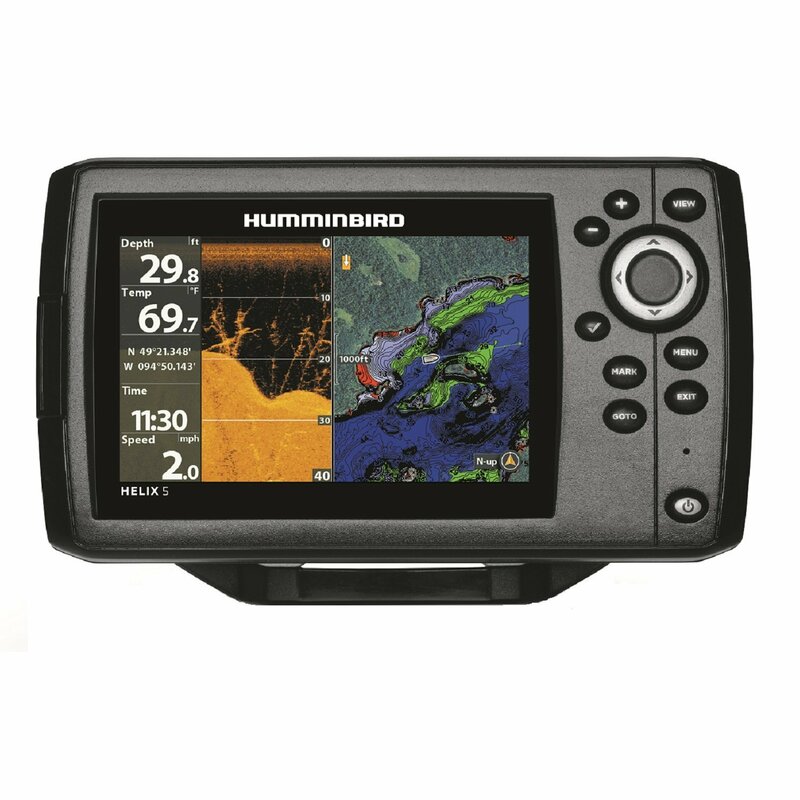 Humminbird 688ci HD DI has an average rating of 2.92 out of 5 based on 13 user reviews. You can get a $50 mail-in rebate if you purchase by July 31st, see the details here. The Humminbird 688 ci HD DI offers anglers a combination of down imaging and GPS. The 688 has a 640 x 480, five inch display with 256 colors and a backlight. Note that this display has lower resolution than the one found in the older 5 inch models that had 640 x 640 resolution. As the result the output is not as crisp and clear. Nevertheless, the new 688 is an attractive offering mainly due to its moderate pricing. The 688 doesn’t have much new technology. Humminbird users are very familiar with Down Imaging and SwitchFire which provides complete control of the appearance of their sonar returns. The output can be adjusted on the fly with the two unique display modes. The presentation of lures can be experimented with, turbulence and temperature can be accounted for and detail can be removed or added all by simply pushing a button. In the Clear Mode, you can reduce the visibility of undesired clutter, such as suspended particles causing interference. You will be able to see only what you want to see. For a clearer image of structure and fish, you can filter out noise in rough conditions. In the Max Mode you will be able to monitor their lures easily by watching the jigging action of artificial lures or live bait action to make sure that the bait is presenting optimally. Even in water currents and thermoclines, you will be able to see fish, structure, and cover. The max mode provides incredible detail. DualBeam PLUS is another legacy feature offered by Humminbird 688. DualBeam Plus gives you 2 sonar beams – center beam that is narrowly focused and surrounded by a second 60 degree beam that will expand the coverage area. In order to show structure, the first beam will be focused on the bottom. The second beam is looking for fish. Although when working together the angler will have a clearer image of what is going on beneath their boat, the beams can be used independently. The precise, 20 degree beam provides high accuracy, while the wider 60 degree beam provides ample search area. The beams can be blended together for a complete picture or viewed side by side or separately. Other user-friendly technologies included in the Humminbird 688ci HD DI are: customizable display colors and background colors, a temperature alarm, and a Triplog. The Triplog allows the user to collect information and statistics on their fishing trip, such as duration, water temperature and water clarity. Like other Humminbird products, the 688ci is waterproof, comes with a built-in backlight for use in direct sunlight. The device’s split screen enables the user to either quickly zoom in for a closer look. You can save your favorite views with three preset buttons that are programmable. The GPS comes preloaded with Humminbird UniMap and supports Navionics Gold and HotMaps upgrades. There is a single SD card slot for saving waypoints and maps. GPS also provides accurate speed. The included transducer – XNT-9-DI-T – is the same as the one used on the old Humminbird DI models. It has 500 Watts RMS, 4000 Watts PTP power output. The 688 comes with a mount that quickly connects and disconnects, the display unit can also be in-dash mounted. You can get a great deal on Humminbird 688ci HD DI here. The GPS on this unit does a cold start if the unit has been shut down for more than two hours. This means a 5 to 10 minute wait time for a GPS lock. The GPS also has very poor sensitivity and will lose lock often if in the open with an overcast sky. This is with the unit mounted on the dash in the open with no obstruction of the entire sky. I didn’t experiment with the unit being covered, but assume it will not lock at all if it is covered by a boat top. I had Humminbird send me a replacement unit and it also performed exactly the same as described above. Also, The depth, speed, temp information are keyed in white boxes on the screen that block much of the chart rather than just keying the digits themselves. A very rudimentary keyer. The unit also does not output NMEA 0183 nor does it have the ability to connect an external GPS antenna. I returned both units and purchased a different brand which I am very happy with. I didn’t have any of problems with the GPS on this unit that are described in the review above. This is my second Humminbird, I have 798 installed at the console and I have 688 installed on the bow of the boat. The 2 systems are connected and I can mark waypoints on the 688 and send it to 798. I use the console unit to find fishing spots and I use the 688 while I’m fishing, I think this is a great setup. 688 is a great value, you can’t get a better unit for less than $500. I upgraded to this unit from 797si. I decided I don’t need side imaging. The image quality on this unit is much better than 797si. I’ve been using this unit for a couple months now and I think it’s great. It does require a bit of a learning curve but once figure it out it becomes very easy to use. I can very easily find drop offs and structure. Before buying I checked it out at my local BassPro and then I bought it on Amazon because it was $50 cheaper. This is a great buy if you’re serious about a quality fishfinder. I was so impressed after buying this unit about a month ago that I just got the second one for the trolling motor. Now I know exactly what’s beneath the boat and can mark fishing spots and avoid hazards. Great product. I bought this fishfinder for my kayak. I have 798 on my boat and I have to say I like the 688 better. It’s easier to use because it’s got fewer menus and screens. Also, down imaging is easier to read than side imaging. Have used my 688ci HD DI only once but well satisfied. It’s easier to operate than my 798ci HD SI Combo. I did notice the screen is slightly narrower than the 500 and 700 series which is a downer. The screen size should not have been reduced. For the money this is a good buy. I purchased this unit brand new from Bass Pro and installed on my Hobie Kayak. I have two problems with this unit. Number one, is the GPS takes a minimum 10 minutes before it picks me up. Then there is the annoying message of the GPS signal fail. I had it out in overcast today with storms approaching and was not getting picked up. I’m wide open off Boston, no obstructions to stop the signal. I’ve seen it reported by some so it has to be a problem for quite a few people with this unit. I have to rip it all out and bring it back to Bass Pro probably just get a newer Lowrance. I have to hold my breathe on Lowrance as well as I had software issues on the Elite 4. I’m really disappointed with this 688. I purchased a 383c years ago and had no trouble for 4 seasons on the kayak. I hope Humminbird works out the issues sometime but I’m in season right now I have no time to wait. I just bought the 688 from Gander Mountain, and I’ve had it out twice. Gps works about 10% of the time, especially poor when moving. Very disappointed with the product and plan to return it. I just purchased my third humminbird unit. I can’t even remember my first as it was so long ago, but it worked like a charm. Since then? I decided to upgrade to the “new” technology including gps so off to the store I go. 500 hundred plus later I had my second humminbird this time a 544 maybe or something like that? gps/sonar combo. This unit would shut off on its own whenever it felt like it, not losing power just shutting down? so back to the store I go to by the 688HD DI combo. Bought in October and installed just last week for its maiden voyage. This unit works nicely at the dock, but when you are out it loses signal constantly. As many other post have stated it says GPS signal fail! Its mounted on top of the dash no obstructions for signal problems. I called Humminbird today, after the 30 minute wait on hold, their technician told me I had to update my software. I asked if this would fix my problem, she could not tell me, only that’s what I needed to do. In doing so I came across this forum and decided to chime in. Humminbird can’t help, don’t call them if you having this problem. Save your time don’t call Gander Mtn. either, they don’t care, just box it up take it back and buy something else. I wish I would have been better informed prior to drilling new holes in the transom of my boat. Keep getting gray screen , and I have to keep turning it off and restarting it. Have a Humminbird 688 ci Di combo, about 3 years old, can’t keep GPS signal if it ever connects. Alarm annoying, now screen got really hot, screen went totally dark. Won’t turn on. Hunnimbird repair $290.45. Can buy a Helix 5 with rebate for about $300.00. Can and will buy a new one but may not be another Humminbird. Great product if it worked. Then they want $200 if you want to see if it can be repaired. Buy something else. This was my 2nd humminbird that failed.